Are Asian Businesses Ready for the Next Technological Revolution? Business leaders in Asia Pacific are showing urgency in embracing new technologies, where 80% of them believe that they need to transform to a digital business to enable future growth and yet only 29% said that they have a full digital strategy in place today. 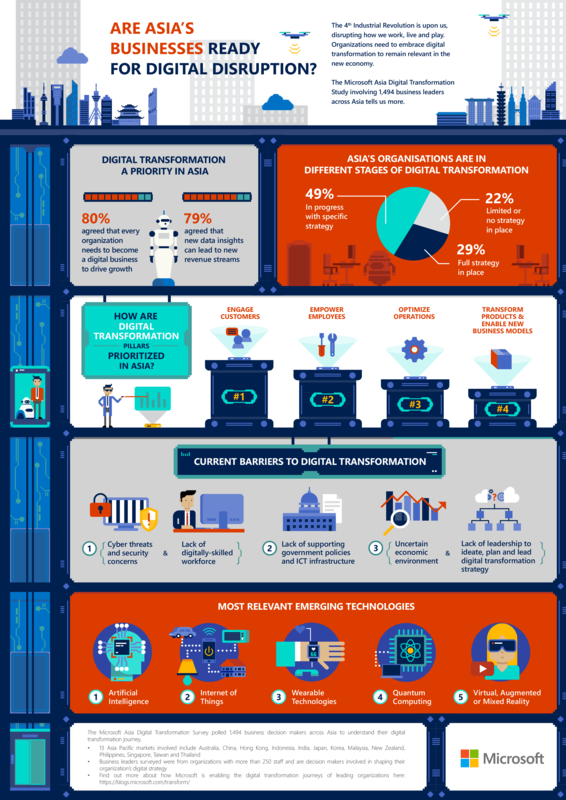 These are some of the key findings of the Microsoft Asia Digital Transformation Study designed to understand how business leaders are embracing the digital era. Technology advancements have ushered in cutting-edge technologies such as Internet of Things (IoT), artificial intelligence (AI), advanced data analytics, and mixed reality powered by cloud computing. This will transform the way people work, live and play. This revolution, together with rapid urbanization, emergence of the millennial workforce and a fragile global economic climate, is ushering societal and economic changes at an unprecedented pace. Will Asia be ready?